This weeks challenge is this lovely sketch by Domi.. I brought this lovely Imaginisce Christmas paper recently and it's great when you can use both the double sided designs in one card. When I saw the Eggnog Christmas stamp just knew I had to add it to my stash. Thanks as always for leaving your comments, reading them is a highlight of my day. Must away to toss Tess of my bed, she's been sleeping long enough! Wowie, how super-cute is this?!?!? 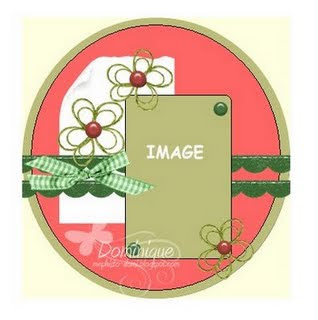 Love the image and the papers and embellies you've paired with it are perfect!! I took a peek around your blog, and I can tell we have something in common :) Love PB and especially her kitties, good luck with my lil mini-candy, looks like it was meant for you!! 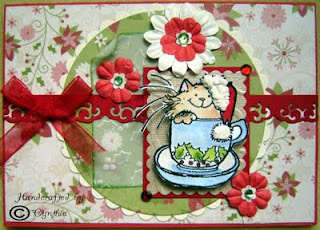 I am following you now, I just adore your PB kitty creations! !